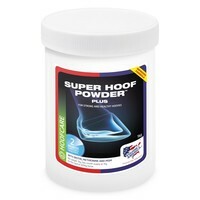 Equine America Super Hoof Powder Plus is a bio-tin rich complementary feeding supplement for horses, expertly developed to stimulate healthy growth in hooves. This daily supplement is particularly beneficial to those horses with weak, brittle hooves and horses with slow growing hooves. Dehydrated Alfalfa Meal, Dextrose, Dehydrated Seaweed Meal, DL-Methionine,Glycine, Vegetable Fat, L-Proline, Dead Yeast Culture, Biotin, Ammonium Propionate (preservative), Sulphur, Zinc Oxide, Pyridoxine HCl (Vitamin B6), d-Pantothenic Acid.